VWA has nine standing committees. We welcome participation by any of our members to serve on any of the committees listed below. Email us for more information or to sign up. Suggests nominee of VWA Annual Awards, slate of officers and board members. Ensures accurate tracking, monitoring, and accountability of funds and ensures adequate financial controls. Provides direction on organizational elements of the associations festivals. Meets to prepare winemaking technical programming for Day 2 of Annual Meeting and prepare/approve Research Exchange Blog Posts. Provides direction on organizational elements on the association's meetings and conferences. Reviews the methodology of the Governor's Cup Competition; provides direction on teh Governor's Cup Gala. Reviews applications of potential Preferred Partners; develops and reviews programs; reviews dues structure of the association. Advises on curriculum for professional development, tracks education looking at tasting room, cellar and more. Note: You must be a dues-paying Legislative member to particiapte on this committee. Identifies issues of importance to Virginia wineries and vineyards; maintains the Legislative Policy; works closely with the Virginia Wine Council. Justin Rose is the President of VWA. Justin Rose, born in Houston, TX and raised in Midland, MI, received his B.S. in Chemical Engineering from the University of Virginia in 2004. Upon graduation he returned to the family farm, Rosemont, in LaCrosse, to help establish Rosemont Vineyards. In 2005, Justin went to Napa to assist in the harvest at Caldwell Vineyards, and that next year, returned to study viticulture and oenology at Napa Valley College. While in Napa, he also interned at O’Shaughnessy Winery and Capiaux Cellars. In the summer of 2007, Justin returned to Rosemont to help oversee the final construction of Rosemont Winery and that fall, lead the first harvest and production of Rosemont of Virginia wines. He is currently in charge of Rosemont’s 22 acre vineyard and 3,500 annual case production. During his tenure as Head Winemaker, his wines have won numerous awards, including ‘Best in Show’ at the 2010 Atlantic Seaboard Wine Competition. When he gets some free time, Justin enjoys golfing, playing soccer, and enjoying time with family and friends over a good glass of wine. Jeff and his brother Eric are the owners of Lake Anna Winery established by their parents in 1990. Lake Anna has 20 acres of estate grown grapes producing up to 5000 cases annually. Jeff graduated from Virginia Tech in 1980 and earned his Master’s Degree in Agricultural Economics 1982. Jeff worked for over 20 years as Senior Program Director at Agrimetrics Associates where he developed key benchmark programs for fortune 100 meat processing companies in North America. He is active in multiple wine trails and past president of the Lake Anna business partnership. Jeff is a father to three young adults that may make Lake Anna Winery a third generation run operation. When he is not on the wine festival trail or working the harvest, he enjoys most outdoor activities that Virginia has to offer including but not limited too hiking, kayaking, skiing, and biking. Michael was born in Williston, VT, became the Marketing Director of The Williamsburg Winery in 2013 at the age of 26. 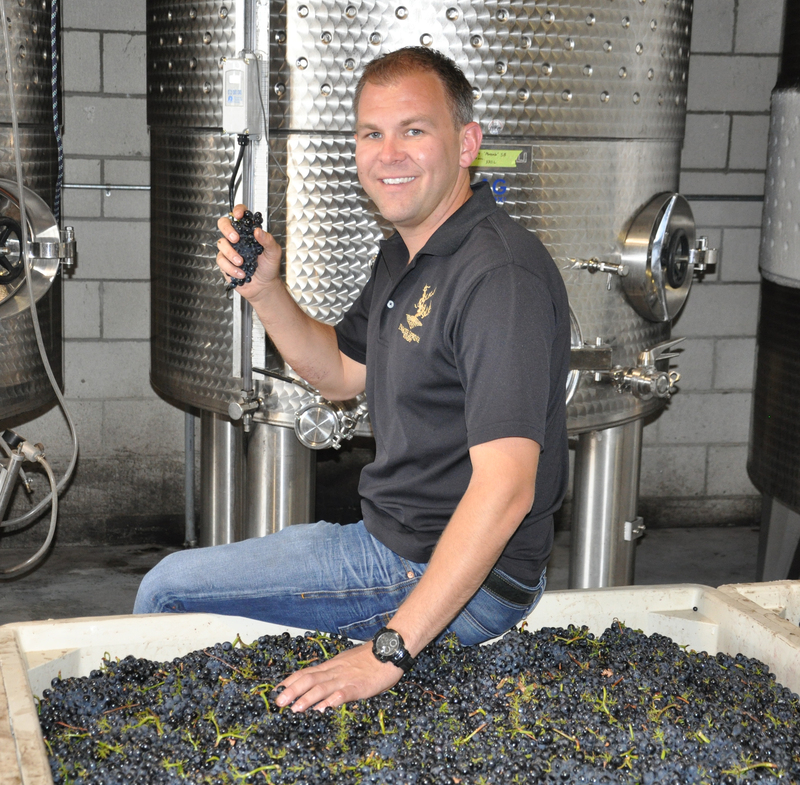 Prior to assuming the responsibilities of the marketing department, Michael served as the Winery's Wine Club Director, Social Media Director, and Wine Festival Manager. Michael currently serves on the marketing committee for the Williamsburg Area Destination Marketing Committee and on the board of the Colonial Virginia Wine Trail. Prior to joining the Winery in 2011, Michael worked as a Brand Ambassador for CIP Marketing, a European based retail and event marketing agency, with a specific focus on the sporting goods company, Adidas. While with CIP Marketing, Michael learned innovative and non-traditional branding strategies and, most importantly, developed a passion for marketing and branding. Michael also spent several years in various management positions with Starbucks Coffee Company - including time spent as Community Outreach Specialist where he was responsible for fundraising and charity event coordination. Michael fell in love with Virginia wine and food while working at the Eat Good Food Group in Alexandria, VA. Michael earned his Bachelor's degree from Rutgers University - New Brunswick in May 2009. In his free time, Michael enjoys cycling, skiing, cooking with his wife, and cheering on his beloved New England Patriots. Ben Jordan oversees all aspects of winemaking, vineyards, and production at Early Mountain Vineyards. Ben is a native Virginian who began his winemaking career in Sonoma County with Dutcher Crossing Winery and C. Donatiello Winery. Ben most recently worked with Michael Shaps at Virginia Wineworks. Along with his father and brothers, Ben also helps run his family’s vineyard in the Shenandoah Valley and makes an aromatized wine called War & Rust. Outside of the wine world, Ben enjoys spending time with his wife and two daughters. Ben is a graduate of Duke University and received his master's from Carnegie Mellon University. Dr. Mitzi Batterson has spent the past 10 years involved in the Virginia Wine Industry. She is part-owner and General Manager of James River Cellars Winery in Glen Allen, VA and has a background in Biochemistry. Dr. Batterson obtained her bachelor’s degree from The College of William and Mary, and then went on to earn her Ph D. from the University of Virginia. Dr. Batterson spent 8 years teaching a variety of Biology and Chemistry course at Randolph Macon College in Ashland, VA. She currently serves on the Board of Directors for the Virginia Wineries Association, the Virginia Wine Council, the Heart of Virginia Wine Trail, and also for the Virginia Retail Merchants Association. Mr. Kilyk is the wine maker and co-owner of Granite Heights Winery. His wines have gained recognition by the Washington Post, the Wine Advocate, and have won numerous awards for wine quality including gold medals from the coveted Virginia Governor’s Cup Wine Competition. Current production at Granite Heights is about 1,000 cases annually. Granite Heights current has about 24,000 vines using high density plantings (2,000 vines per acre). Except for the Barbera, all other vines at Granite Heights are ENTAV certified. Mr. Kilyk holds a B.A. degree in Chemistry from Lehigh University (1986), and a J.D. degree from Catholic University (1989). He is a member of the District of Columbia Bar and Pennsylvania Bar, and is also admitted to practice before the Court of Appeals for the Federal Circuit and before the USPTO. Practicing patent and trademark law since 1988, Mr. Kilyk has worked for several Intellectual Property Firms in Washington, D.C. prior to opening Kilyk & Bowersox. For over 6 years, Mr. Kilyk was a part-time Professor wherein he co-taught a Patent Law course at American University, Washington College of Law and previously at Catholic University (Columbus School of Law). Mr. Kilyk has made numerous presentations to the Intellectual Property Law Association and the American Chemical Society and to various corporations regarding various intellectual property issues. Cindi’s previously worked as Paramedic and ran the Stafford County Career Fire and Rescue services. She was a Certified Emergency Manager for the VA. State Dept. of Emergency Management; and worked as National Capital regional liaison under Governor Mark Warner before retiring to design, build and open Potomac Point Winery 2007. She has been general manager for Potomac Point Winery since May 2007. Cindi holds a certificate of Viticulture and enology from Piedmont Community College. Dr. Obiso is the Managing Director for Attimo Group, LLC (Whitebarrel Winery) and is the Managing Director and Partner at Avila Scientific, an international bio-surveillance/public health consulting company. His research focus is centered on product development and research management of bio-defense-related research projects. Dr. Obiso is a well experienced international project manager, with current projects in Europe, Caucasus, Middle East, and the USA. Dr. Obiso has had more than twenty years of experience in biotechnology, with an emphasis on basic research, product design and development, and project management. Dr. Obiso has successfully developed and launched numerous products in the biotechnology research and in vitro diagnostic markets. He has in-depth knowledge of research, marketing, product development, competitive analysis and business development areas. As the Managing Director at Attimo Group, Dr. Obiso is the wine maker and is responsible for oversight and management of wine production, vineyard operations, quality management systems, and day-to-day operations at the winery and restaurant. Joan Bieda is Vice President and partner in Horton Vineyards. Joan Bieda grew up in Western New York on a dairy farm which still exists today owned by her brothers. She learned the ins and outs of entrepreneurship from her dad. Each day was a struggle between the weather and the crops. She graduated from University of Buffalo with a degree in Accounting. In 1977 Joan Bieda and Dennis Horton opened an Office equipment company in Virginia selling to the Federal Government. Joans' first account was the Department of Agriculture. Due to the success of the business they were able to start Horton Vineyards in 1989. Joan has been instrumental in running the winery’s festivals and keeping up with innovative ideas. She tracks what is going on in the market place in respect to pricing and varieties of wine. She also does the accounting and all the fun stuff of keeping a winery up and running. A native of Virginia, Jordan got her first taste of working in the wine industry while helping a friend out at a small wine shop. It was there that her love for all kinds of wine grew. Jordan’s experiences at the wine shop later lead to leaving her position with a government contractor to pursue a career in wine. She started out in the industry as Tasting Room and Wine Club Manager at Boxwood Winery and quickly realized she had found her niche in the wine industry. Curious about the winemaking process, she headed for New Zealand to work harvest in a 2 million case production facility. Jordan arrived at Stone Tower in 2014 right at the heels of that southern hemisphere vintage. Her position at Stone Tower has evolved from Production Administrator, working in the cellar and vineyards, to Winery Operations Manager, where she uses her degree from Virginia Commonwealth University to manage human resources, compliance, finance and everything in between. Jordan enjoys cooking, cycling, playing golf and spending time with her friends, family and dog. Bill Gadino received a BSEE degree Villanova University in 1968. His MSEE degree Naval Postgraduate School, Monterey, CA in 1973 and his Engineers degree Naval Postgraduate School, Monterey, CA in 1974 Ha was Active Duty United States Navy 1968-1988. Retired as Commander USN Developed interest in winemaking during three Navy tours in California. During those days, when you visited a winery, your tour included discussions on the vineyard, cellar processes and finally a tasting. The more I learned, the more my interest in winemaking and grape growing increased. After Navy retirement and while working with industry, my wife and I purchased land in Rappahannock County VA. In 1990, we planted our first grapes (Cabernet Franc, Seyval, Chardonnay, Cab Sauv). subsequently, we made home made wine and also sold grapes to Gray Ghost winery. I also met and took winemaking and grapegrowing classes from Jim Law (Linden Vineyards). In 2004, we build our winery (Gadino Cellars) and opened our tasting room in 2005. From my early days with grape growing and wine making, I have belonged to both VWA and VVA. I did serve on an original committed to develop a Wine Quality Program for Virginia. I currently volunteered for the VWA nominating committee. I have also taught community classes for beginning grape growing here in Rappahannock County (our community program is called Rappahannock U). Our vineyard now exceeds 7 acres with the following grapes: Pinot Grigio, Chardonnay, Vidal, Seyval, Cab Franc, Cab Sauvignon, Nebbiolo, Petit Verdot and newly planted Petite Manseng. Our Gadino Cellars 2010 Nebbiolo was awarded a Gold Medal at the Virginia Governors Cup. Kirk Wiles, 31, founded Paradise Springs Winery in 2007 at the age of 24. After successfully litigating through a challenge from Fairfax County over its right to open as an agricultural entity, Paradise Springs now produces 10,000 cases of wine a year and serves as the closest winery to Washington DC and first in Fairfax County. A graduate of the University of Miami with degrees in both Finance and Marketing, Kirk was recently appointed by Governor McDonnell to the Board of Agriculture and Consumer Services. Prior to the opening of Paradise Springs, Kirk worked as a financial modeler in the structure finance field as well as the marketing department of the Washington Nationals baseball team.